So - what actually is 'lifestyle' photography? Personally, I describe lifestyle photography as a more relaxed and natural type of photography session. My aim during any session is to capture the uniqueness of you and your family, to capture connection and emotion and to take photos as raw and as honest as I can. You are unlikely to hear me ever say 'now everyone look at camera'. If I do, I give you permission to tell me off! What is a photography session with you like? Good question! I like to move. Kids like to move. People are so much less self conscious when moving. So we move. If we're outside, we're likely to go for a bit of a walk. I'll be constantly on the lookout for gorgeous light (I LOVE gorgeous light and I'm ALWAYS looking for it). If it's an in-home session we'll still move a lot. If it's ok with you, I might ask the kids to jump on beds, have tickle fights, get pulled around floors on blankets, snuggle up in beds. I'll get the kids to show me their rooms and their favourite toys. If the weather is nice, we can go outside and play in the backyard. I'll direct you to move into a nice patch of sun, or a nice patch of shade. I'll ask you to interact with your family, tell secrets, tickle, tell fart jokes, whatever is natural for your family when you're playing. I'll get you to cuddle in tight, I'll ask you to kiss a cheek, or play with your daughters hair. But what I really want is for you guys to relax into being YOU. I want to capture photos of YOU. Not just a version of you, but YOU. You and your family. Being YOU. Have I said YOU enough? Get the picture? The pace of the sessions are usually set by the youngest and/or most active family member! I know what kids are like, and they usually don't want to be told what to do and how to do it. I'll keep the pace of the session interesting enough that hopefully the kids won't lose interest too quickly! Yes. Let's do! We have 2 main options - in-home or outside. For outdoor shoots, I have a range of locations around the Albury-Wodonga and North East Victoria area that I love to do sessions at. I will suggest some if you want. But I'm always keen to learn about new ones, or particularly locations that mean something to you. Tell me! I want to hear it. If I don't think it's suitable I'll let you know, but it's more than likely I'd love to try it! Ok, so if we decide we want an in-home session - do I have to hire a cleaner and spend a week cleaning the house? Ummm, no. I love lived in homes! You'll want to do a quick tidy up, putting toys and clothes away. When I arrive, I'll ask for a quick tour of your house, and I'll pick 2 or 3 rooms we're likely to take photos in. Usually the master bedroom, lounge room and maybe a kids room, or a sitting room. I look for nice light! So I suggest clearing off your bedside tables, leaving a lamp and a book, but hide photo chargers, baby monitors, tissue boxes etc. No one needs to know they've been popped in a drawer! Clean fresh bed linen is a good idea too! And remember that the your choice of bed linen can be just as important as your clothes! I suggest lighter coloured doona covers and sheets if you've got them - dark colours can really pull the light from a room and make for quite dark images! Kids rooms are kids rooms. A quick tidy up of toys and clothes is generally all that is needed. And for lounge rooms or living areas, again hide that tissue box, and hide those phone chargers and toys! A gorgeous vase of fresh flowers can add a gorgeous pop of colour into a room. If your lounge room backs onto your open plan kitchen, again just a quick tidy up of bench tops is generally all that's required. But your house does not need to be ready for the cover of Vogue Living. I have kids. I know what real life is like. I don't want you to stress over the state of your house. I can always move a couple of things that I think might detract from the photo, and remember anything behind me won't be seen!! And please don't stress, I am the last person to judge you! So, we've picked an outdoor session - what time do you do those? I'm non-negotiable on this - I only do outdoor sessions starting an hour or so before sunset - and I finish up at sunset or very soon after. And yes, this means in summer my sessions don't start until 7:30pm and yes I know it's after kids bed times. I understand the struggle. My kids have an early bedtime too. But I try to suggest that if your kids still have day sleeps that see if you can tweak their sleeps a bit to accommodate a later than usual bedtime. Or maybe have a quiet afternoon to let them have a bit of rest before the session. It's a once off, and if you're interested in booking me because you like the photos on my webpage, then that gorgeous soft light you see in all my outdoor photos - they were all taken at sunset. You just can't replicate that light in the middle of the day. Unless of course you want to do sunrise! I'm keen if you are! I'm more than happy for you to bring along some snacks if you think that will help your kids to push through. We can stop for a quick break, and that often gives us a quick opportunity to get some photos of you and your other half without the kids hanging off you! From my experience, kids are pretty damn excited to be able to stay up a bit late and do something a bit out of the ordinary, so melt downs are few and far between. I would say I'm yet to see a proper meltdown, but I don't want to jinx you! Ok, we've booked our session now what do we wear?! I get asked this a LOT. There is no hard and fast rule as to what to wear. This shoot is for you and your family, so my first piece of advice is to wear what you're comfortable in, what represents you. If you NEVER wear dresses, don't feel like you should wear a dress because you've seen it in someone else's photos. But if you've decided you love photos with wind blowing a maxi dress and that's what you want - do it! I suggest you (I'm going to guess you're the leading lady of the house, and I apologise if I'm wrong) pick your outfit first. Wear something comfortable. If you're not comfortable, it'll show in the photos. Flowing maxi dresses look gorgeous, but if you don't ever wear them, don't buy one just for the photo shoot. Remember, you want the photos to represent who you are! Then pick the rest of the family around what you're wearing. Eg if you're wearing a top with blue, pink and yellow, then you might dress your daughter in a yellow dress, and your son in a blue shirt. Pinterest is a great way to look for family style combinations. Feel free to accessorise! Scarves, earrings, boots! Smart casual is a good place to start. What if the weather forecast isn't looking good, or someone gets sick? We will reschedule. I will find a spot to fit you in on my calendar at a time and date that suits, and we'll try again! Weather can be unpredictable, so we have to work with what we've got! And I get it, kids get sick, so do we adults sometimes! If I am sick, I absolutely will not do a newborn session. I don't want to be that person. So I'll call and we'll book it in for another date. As an FYI, I am also up to date with my vaccines! Newborn sessions - how old, when, where? I will photograph babies of any age. It doesn't worry me if your baby is 1 week or 1 year. I don't spend hours trying to get your baby to go to sleep, I'll photograph them cuddled in your arms, or laying in their cot, or on your bed. They can be awake or asleep. I really don't mind. 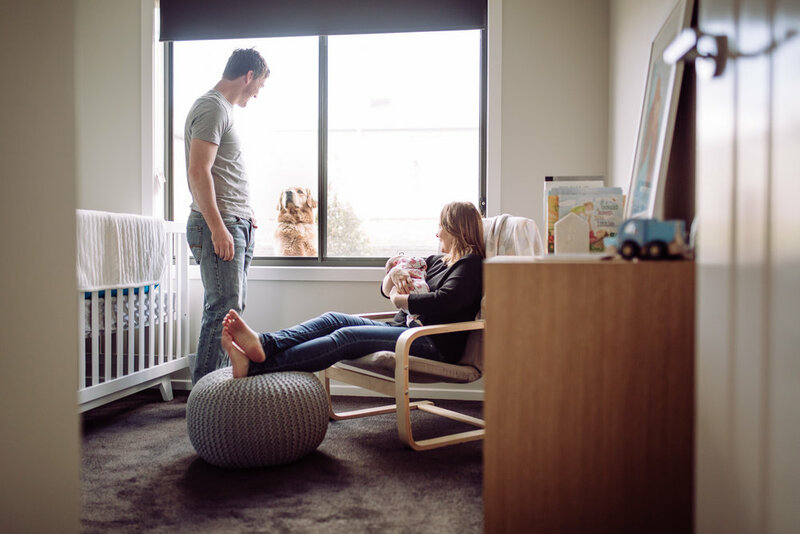 Newborn in-home sessions start at about 9:30am and can take between 1-2 hours, depending on how settled bub is, how crazy the other kids are (if you'e got other kids!). I'll stop for feeds and settling. If you do need to feed, please let me know! Please don't try to push on through, everyone can start to get a little distressed if you do! I truly don't mind. I will ask you if you want some photos while you're feeding. Feel free to say no if you don't want any. But if you do, these are for your eyes only. These moments are precious and tender, and they are yours. So don't stress I won't go splashing them on social media (unless you tell me otherwise). Oh, and if you do book a newborn session let me know how you take your caffeine, I will arrive bearing coffee for you poor sleep deprived souls! I will always ask you if you mind me posting some of your photos on social media - ie my website, Facebook and/or Instagram. If you don't want me to, that is fine. I won't pressure you to. I understand people want their privacy and want to be in control of what goes out into the world. If you do, awesome and THANK YOU!! The large majority of my business is generated by word of mouth - by people seeing their friends photos on Facebook. And that is how my business survives. If there is anything else you're unsure about , just pop me through an email and I'll answer it as best I can.